To export your Collage, click Export icon in the upper right corner. The Export panel will be displayed. Enter the maximum width of the exported collage (since web images scroll, you don't need the height) and the quality setting you prefer in the available fields and click Export. If you've previously exported a collage, your recent sizes will be displayed in the "Recent Export Sizes" box. You can select an export setting directly from this box. When you are ready to export, click the Export button. You'll be prompted for a save location on your computer. 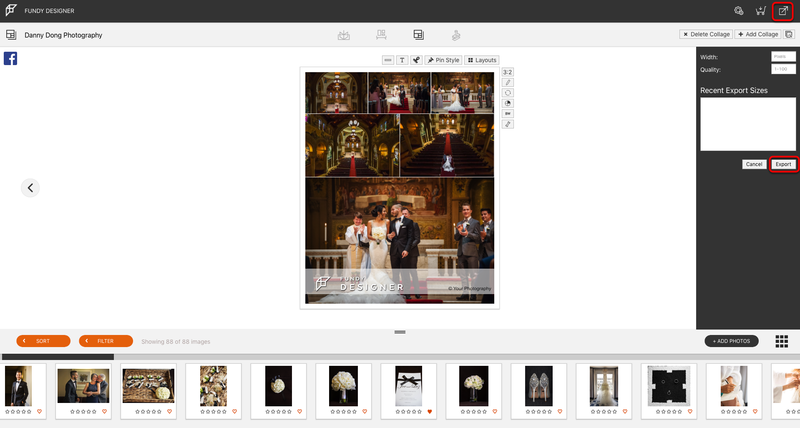 If you have multiple collages in this project, all of them will be exported at once. Each collage will be sequentially numbered with your collage name. When the export is finished, you'll receive a notification that it's finished.